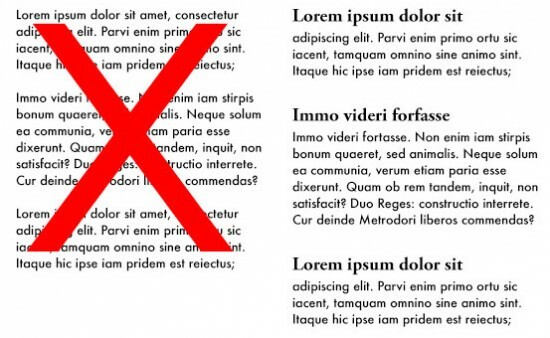 In the past, web designers believed they are obligated to select the one font that embodies the brand, but is that as far as web fonts can go? Designers can mix and match different fonts to create a more visually appealing page. It serves its purpose as an attention grabber, but be careful not to use too many typefaces. While it’s important to have beautiful fonts, making sure your content is legible is just as important. A common and easy strategy is to pair serif fonts and sans-serif fonts together. The fonts used remain consistent with Ready Artwork’s brand. Color choices and placement of the type aren’t distracting and doesn’t take away from the content. Your typography should easily guide your viewers through your content. Even if the website’s content is good, viewers will be too distracted by poor structure. The presentation of your content is important because it can impact the effectiveness of your website. Good typography clearly emphasizes the most important points and guides your readers fluidly through your website. If you are not ready for a big website makeover, typography will be the perfect first step to renovate your website. Remember, trends change for a reason; typography is gaining in popularity because of its limitless potential and browsing experience enhancement. What are you waiting for? Showcase your typography creativity on your home page banner or featured images today!